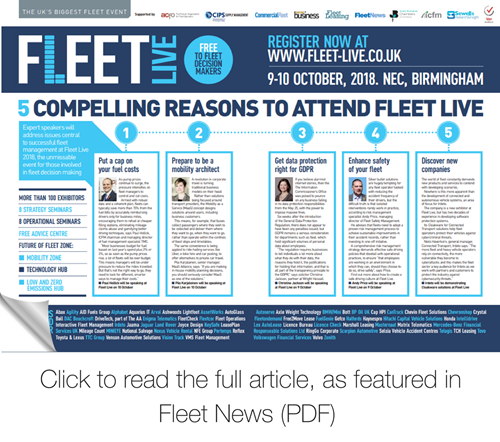 Expert speakers will address issues central to successful fleet management at Fleet Live 2018, the unmissable event for those involved in fleet decision making. ​As pump prices continue to surge, the pressure intensifies on fleet managers to control and cut costs. Armed with robust data and a coherent plan, fleets can typically save more than 15% from the fuel bills by accurately reimbursing drivers only for business miles, encouraging them to refuel at cheaper filling stations, eliminating mileage claims abuse and gamifying better driving techniques, says Paul Hollick, ICFM chairman and managing director of fuel management specialist TMC. Paul Hollick will be speaking at Fleet Live on 10th October. A revolution in corporate travel is turning traditional business models on their head. Rather than solutions being focused around transport providers, the Mobility as a Service (MaaS) concept designs solutions around users, including business customers. This means, for example, that buses collect passengers where they wish to be collected and deliver them where they want to go, when they want to go, rather than operate within the confines of fixed stops and timetables. Piia Karjaleinen will be speaking at Fleet Live on 10th October. If you believe alarmist internet stories, then the The Information Commissioner’s Office was poised to pounce on any business failing in its data protection responsibilities from the May 25, with the power to impose massive fines. Six weeks after the introduction of the General Data Protection Regulation, there does not appear to have been any penalties issued, but GDPR remains a serious consideration for departments such as fleet, which hold significant volumes of personal data about employees. Christine Jackson will be speaking at Fleet Live on 9th October. Silver bullet colutions are hugely tempting for any fleet operator tasked with reducing the accident frequency of their drivers, but the difficult truth is that isolated interventions rarely work in practice, according to risk management specialist Andy Price, managing director of Fleet Safety Management. He advises that fleets need to adopt a proven risk management process to achieve sustainable improvements in their accident records, rather than investing in one-off initiative. A comprehensive risk management strategy demands effective safet driving policies that dovetail with operationl practices to ensure that employees are working in an environment in which they can, should they choose to do so, drive safely," says Price. Find out more about how to create a safe driving environment at Fleet Live. Andy Price will be speaking at Fleet Live on 9th October. The world of fleet constantly demands new products and services to contend with developing scenarios. Nowhere is this more apparent than the development of connected and autonomous vehicle systems, an area of focus for Irdeto. The company is a new exhibitor at Fleet Live, but has two decause of experience in developing software protection systems. It's Cloakware for Connected Transport solutions help fleet oeprators protect their vehicles against cybercriminal threats. Niels Haverkorn, general manager, Connected Transport, Irdeto says: "The more fleet and heavy vehicle operators rely on connectivity, the more vulnerable they become to cyberattacks and this makes the fleet sector a key audience for Irdeto as we work with parners and customers to protect the industry against cybersecurity threats". Irdeto will be demonstrating Clockware solutions at Fleet Live.